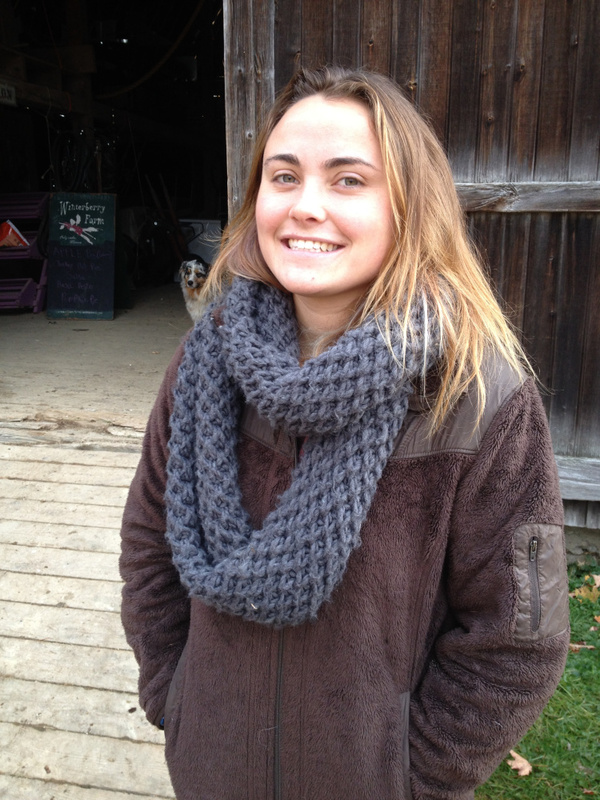 The process was started by Kenya Perry, whose family farms the property, for her home-school capstone project. 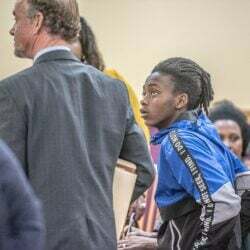 BELGRADE — As Kenya Perry stood in her rubber boots on the ramp leading into the family’s gambrel-roofed barn Wednesday morning, her younger sister Sage Whitehead mucked out one of the horse stalls trailed by Tom and Jerry, two turkeys with brown and white feathers. It was business as usual in the three-story barn, which was built in the post-Civil War era with openings between almost every board on the far wall to allow the air to circulate and thus reduce chances of fire starting in the hay. “It’s very airy, which is cool, but very cold,” Perry said. 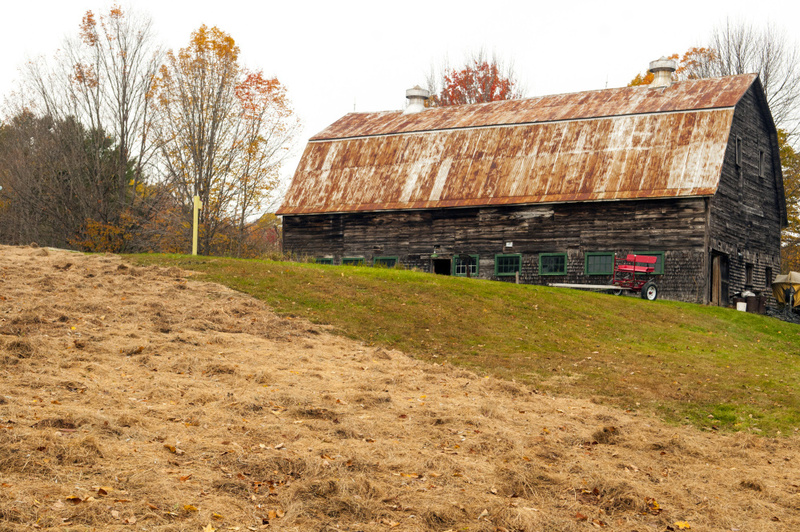 The barn itself — to be known as the Foster Barn at Winterberry Farm — has been nominated for inclusion on the National Register of Historic Places. The nomination process was initiated several years ago by Perry, now 20 and a sophomore at College of the Atlantic in Bar Harbor, as part of a capstone project during her final year of her home schooling. It proved to be a labor of love. 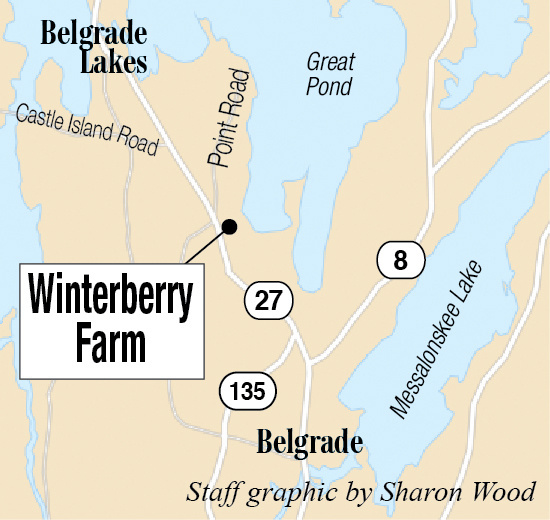 Her family’s Winterberry Farm barn, which contains the former Foster Family Barn, is just off Route 27 in Belgrade. 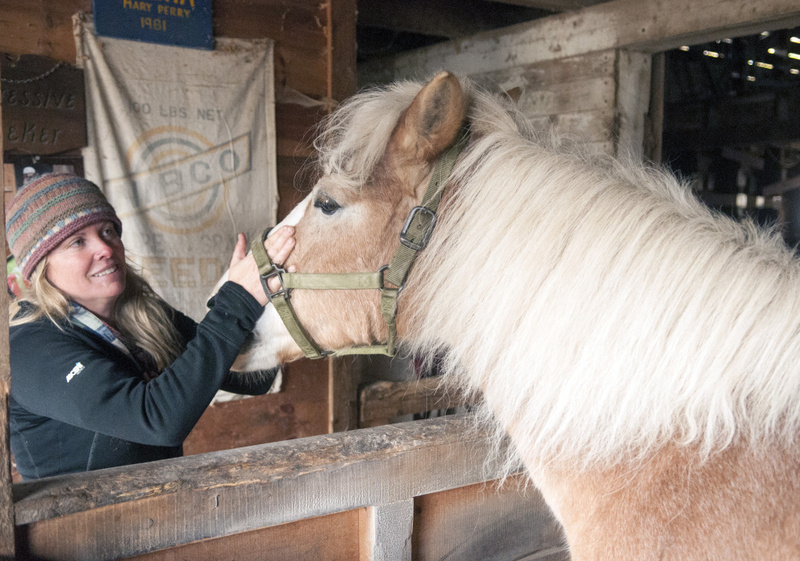 Today the barn houses animals and an area where those who buy shares in a community-supported agriculture program can pick up their goods, and it stores many of the farm’s items, including stacks of dried hay on both the second and third stories, and sleighs, canoes and chicken crates. 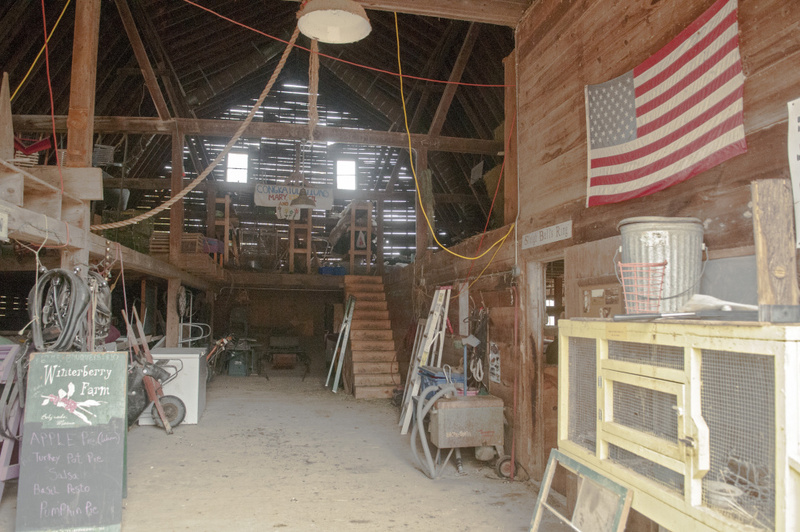 “I just really wanted to preserve our barn,” Perry said, looking around at the beams and posts. Rather than being solid, they consist “of two or three side-by-side six-inch planks,” the nomination paperwork says. As part of her project, she determined that thick round nails held the structure together, not pegs or square nails. The roof is metal, and the exterior has narrow, weathered cedar shakes on the first floor as well as a line of them above the barn door. The fabric ductwork reaching to the ridgepole resembles large hot-air ductwork. Most of the windows lack glass, but many have chicken wire screening to keep birds out. Along with the horses, the family has a team of oxen, three sheep raised for their wool, a flock of chickens for eggs and meat, and turkeys for meat — except for Tom and Jerry, heritage turkeys brought in six years ago by her brother Gilbert and spared each Thanksgiving. The nearby farmhouse was built in 1870 with an attached barn, which was lost to a fire some 25 years later, a blaze that also threatened to destroy the home. When the new barn was erected about 1900-1910, it was sited a few hundred yards away from the house to minimize the danger. 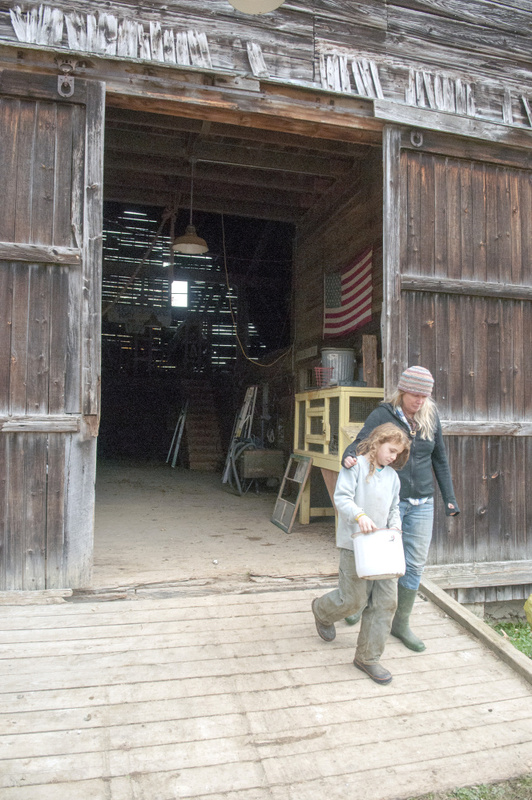 When Kenya Perry’s mother, Mary Perry, moved the family there in 2001, the barn had not been used for 25 to 30 years, Kenya Perry said. Most recently, it had been used as a dairy barn, and the stanchions for the cows were still present. The Perry family converted the interior to its new uses, installing horse stalls and even some handy trap doors on the floor of the second story so feed and wood shavings can be dropped neatly into the correct stalls. There’s also a set of stairs to the second floor, which is part of its more recent history. “I fell off the third floor when I was about 8 and landed on my back,” she recalled. She got up and continued moving around and began a competitive swimming career at 13. Years later, when her legs became numb as she swam, she learned she had a broken vertebrae, which was fused last November at Boston Children’s Hospital. She is still recovering. The 40-acre farm, which stretches from the road to a marshy area on the edge of Great Pond, already has had some preservation protection. 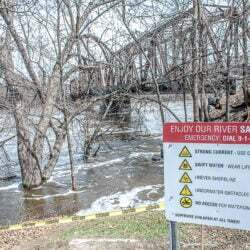 In December 2012, an agricultural easement was placed on the property by Maine Farmland Trust and the Belgrade Regional Conservation Alliance, protecting it from ever becoming anything else. The Perry family has two hoop houses, growing some vegetables such as spinach and kale throughout the winter, as well as seven large gardens with “just about every vegetable you can imagine,” Kenya Perry said. Her philosophy helped play into her choice of a college, where she is focusing her studies on marine biology. “We’re one of the greenest schools,” she said, adding that her dormitory has composting toilets, solar panels and heated floors and that much of the food served comes from the college’s two farms. Even so, she still will bring some food from Winterberry when she returns. 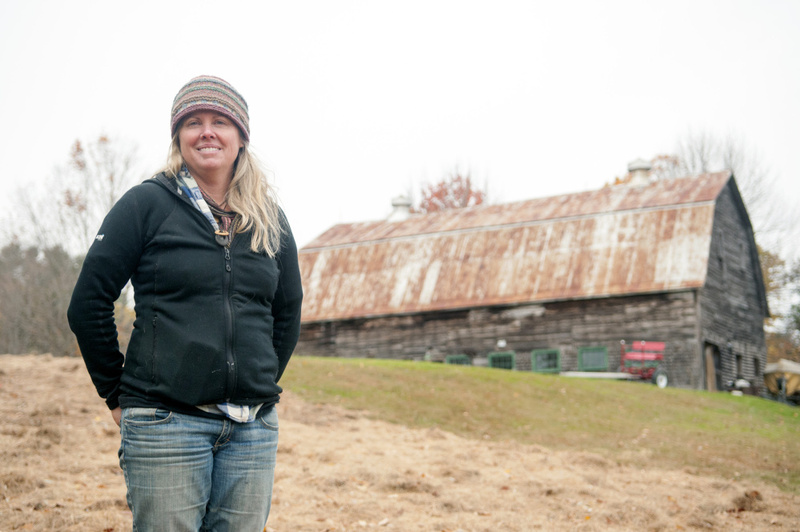 Christi Mitchell, architectural historian at the Maine Historic Preservation Commission, said Kenya Perry sent in the National Register Eligibility Assessment form and supplied some additional information, and then Mitchell completed the nomination. She said that during the 45-day public comment period, the documentation is reviewed for technical and substantial accuracy. “I actually think I will learn whether it is listed within the next couple of weeks,” Mitchell said. 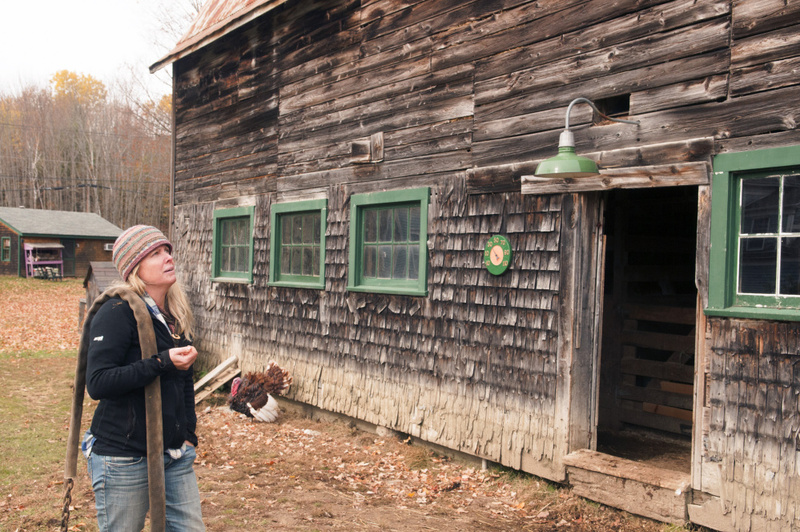 She said the barn is important because of its ventilation system and the structural system of the barn itself. “It’s not really stick-framed and not really timber-framed; it’s an unusual kind of transition,” she said. 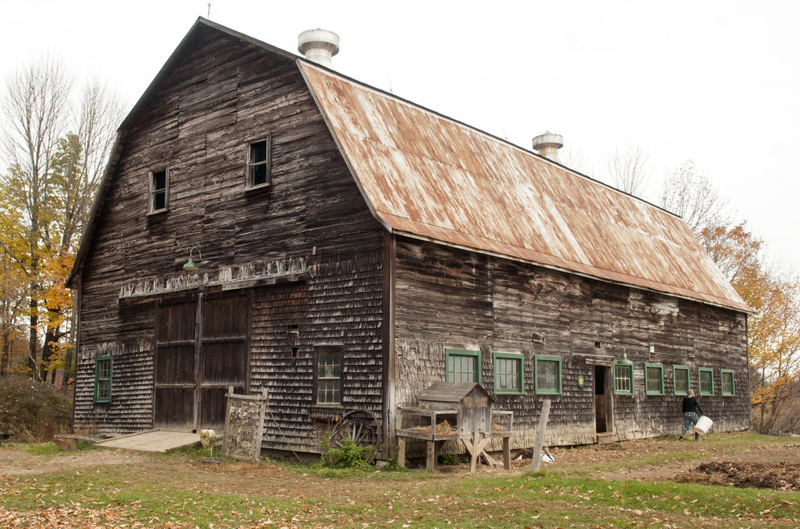 Mitchell said this would be the ninth individually listed barn in the state, although a number of other barns are part of properties, such as a historic home, that are also on the register. The designation is primarily an honor, Mitchell said, but it might also qualify an owner for rehabilitation tax credits. “It’s a good project for somebody to undertake,” she said. Several other properties in Belgrade Lakes village already are listed on the National Register of Historic Places, according to Town Manager Greg Gill, who added that other buildings could be eligible.